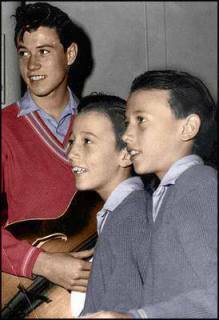 Barry Gibb, Robin Gibb & Maurice Gibb, later added Colin Petersen (d) & Vince Melouney (l.g). For a brief moment after their arrival in England in 1967 the group were going to call themselves, “Rupert’s World”. (Only the 60s recordings) Not completed yet.